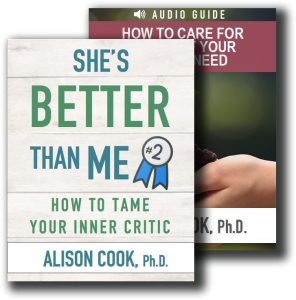 True Guilt vs. False Guilt - Alison Cook, Ph.D.
Have you wondered if you have an overly sensitive conscience? Think about this for a moment: The presence of guilty feelings don’t always mean we are guilty. We have to learn the difference between true guilt vs. false guilt. . . the difference between true guilt that comes from a Spirit-led conscience or false guilt that comes from a shaming inner critic that’s taken on an extreme role. The difference between true guilt and false guilt has to do with the standard to which we are measuring ourselves. If we know that it’s wrong to lie, for example, but we continue to do so even when our conscience is pricked, then the guilt we feel is true guilt. But if we’re struggling to keep our house in order or our bodies in shape as a result of a series of stressful events, or if we feel guilt that we can’t respond to the needs of every single one of our friends. . .the guilt we feel is most likely false guilt, or even more specifically shame. In this latter case of false guilt, the negative feelings we direct toward ourselves are based on a self-imposed standard and may well be far from God’s expectations. Pause for a moment, close your eyes, and quiet your soul. Focus on the guilty feeling and get a sense of it’s message. Is it judging you? Shaming you? “You are such a miserable wreck. You should be doing so much better than this!” or “You are such a terrible person! Why can’t you get it together?” Such shaming messages aren’t from God. Instead, they come from parts of us that are trying to beat us into submission . . . and they rarely lead to anything but more feelings of shame. On the other hand, when you check in with that guilty feeling, you might notice that clean prick of a Spirit-led conviction. “Perhaps I could have phrased that differently when I told my friend I needed a little space.” “I regret that I wasn’t more patient when I got frustrated with my daughter.” True guilt is clear and and offers a resolution. Typically, it’s solved with a humble, “I’m sorry” – whether to God or to the person you may have hurt or offended. God doesn’t prick our consciences with shame-laden tirades. His voice is clear, swift, and offers a clear path to compassion and forgiveness. In the instance of false guilt, our consciences have become extreme, and may have been influenced by false expectations imposed on us by others and internalized. In this case, your conscience becomes a guilt-tripper—harping on you for every perceived failure. When false guilt overtakes you, even asking forgiveness and making amends won’t alleviate your sense of failure. Whereas a guilty feeling that comes from God leads to confession, repentance, and renewal, guilt that’s too close weighs you down and creates burdens you aren’t meant to carry. It nags you for doing something wrong . . . even when you didn’t. False guilt or a shaming inner critic both work to protect you from accepting your human limitations or grief you might not want to face. They badger you and beat you up internally as if to say, “If YOU had done better, you wouldn’t be facing this pain.” “You could have kept yourself out of this situation.” It’s often easier to take all the blame on ourselves than to face the reality that for whatever reason, we’re facing circumstances that are just painful and difficult to remedy. Note the number of times you feel guilt throughout a day. Get a sense of what the guilty voice is saying to you. Get curious about that guilt-tripping part of your soul. How long has it been with you? What is it trying to accomplish by continually berating you or reminding you of all your imperfections? Honor the fact that it’s likely been trying to help you be your best self. It likely came by that habit naturally. Is it open to change? Pray for that part of you that has picked up this self-shaming habit. See if it’s open to learning new strategies to motivate and encourage you.